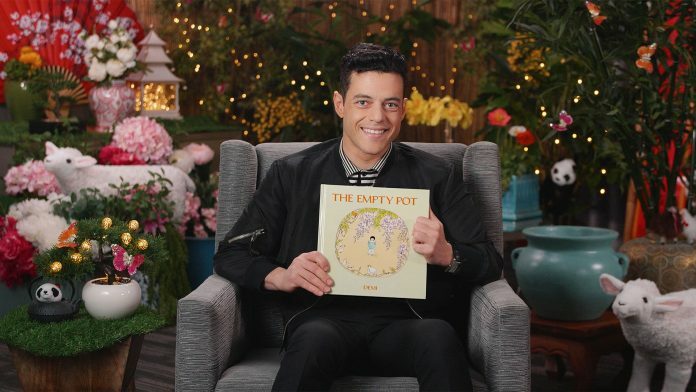 The 2019 Best Actor Oscar and SAG Award winner Rami Malek is the newest reader for the SAG-AFTRA Foundation’s children’s literacy program Storyline Online (storylineonline.net). Malek reads The Empty Pot (storylineonline.net/books/the-empty-pot/), written and illustrated by Demi, and published by Henry Holt Books for Young Readers, an imprint of Macmillan Children’s Publishing Group. An Emmy-nominated program of the non-profit SAG-AFTRA Foundation, Storyline Online streams 55 videos at no cost to children, parents, and educators worldwide. The site receives over 10 million views every month and is endorsed by the American Federation of Teachers, representing 1.7 million teachers and education professionals. As with all Storyline Online videos,The Empty Pot comes with a complimentary supplemental activity guide aligned with Common Core Standards that strengthens verbal, written and comprehension skills. Aimed at 1st-2nd grade students, these activities encourage children to engage in critical thinking activities and ponder the themes of the book including honesty, telling the truth and triumph through failure. To watch The Empty Pot and all Storyline Online videos, visit storylineonline.net, and subscribe to youtube.com/storylineonline. Keep up with new videos in 2019 by following @StorylineOnline on Twitter and Storyline Online on Facebook.